As you know, Milwaukee, Wisconsin, is engaged in city flag redesign. I will be heading there in two weeks to help guide the 5-person jury selecting the finalists. I’m sure I will have a full report at the next meeting! MilwaukeeFlag is accepting design submissions through 14 April. For a list of the many city flag improvement efforts underway across North America, click here. What a ridiculous flag!!! Hopefully the competition will be clean, not like in some countries where the flag committee is manipulated by dark forces. South Bend recently adopted a new flag. I wish they had followed your procedures– displaying a significant number of semifinalists. Good Job! Caution: South Bend’s new flag has a star copied from the flag of Chicago. 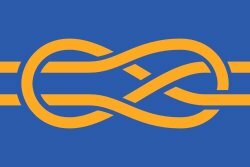 The “vexillologist” on the committee apparently did not point out that using a symbol from another city implies a connection. The committee announced only 3 finalists– all with the same shaped star. Then people were supposed to comment on the preordained (and, in my opinion, inappropriate) symbol with no consideration for other symbols that may have been (who knows– they were never made public) submitted. The design was unveiled–and distributed– before it was officially adopted. I hope the citizens and the committee have the opportunity to consider and discuss symbols that will enable you to create a unique and meaningful flag for your great and unique city!